March 10th 2017, the Yanchi County councilor Mr. Dai Peiji and following government members visited Hanas Group for official survey research. 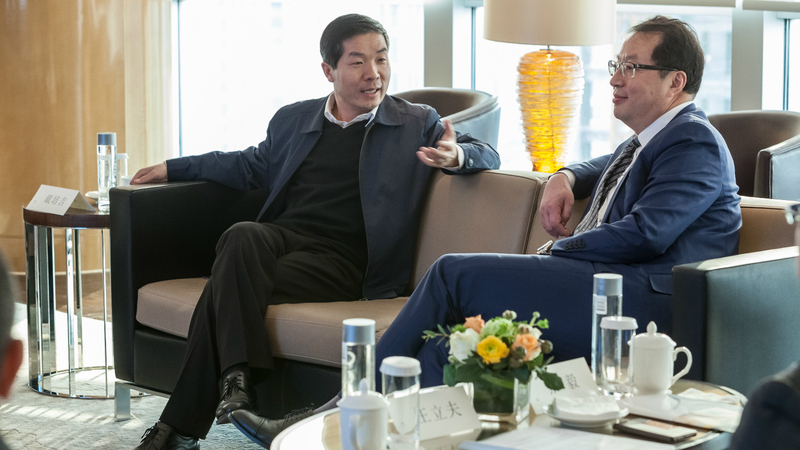 Hanas Group President Xu Changning and the Vice President Zhang Yi accompanied and convened thematic forum. Group President Xu Changning expressed gratitude to Yanchi County for these years’ support to Hanas, He pointed out Yanchi is a blessed land with treasure and with excellent investment environment. Yanchi has abundant natural resources which is most suitable for developing new energy. So far these years, Hanas has built 700,000 kilowatts wind power station, by the end of this year, another 300,000 Kilowatts wind power will be built and on grid, the total investment is nearly 6 billion yuan. During the “13th Five-Year” period, Hanas plan to start Ningxia 5 million tons LNG integrated base construction which has already been included in the Ningxia Province “13th Five-Year” Program. The natural gas source of this base is from Hangjinqi–Yinchuan Gas Pipeline Connecting Project which is listed in the national natural gas development plan in the “13th Five-Year”. Another project is Hanas – Vestas wind power technology service base construction which investment is about 15 billion yuan. After the presentation of the two projects, the councilor said, Hanas is an internationalized enterprise developing in green energy, over the years, it gives an economical and efficient support to Yanchi where the area is still in destitute and underdeveloped situation. The planning of Ningxia 5 million tons of LNG integration base will become a regional large-scale clean energy center in Ningxia and shanxi area, and would be the largest one in Northwest China. The Hanas – Vestas wind power technology service base will boost Yanchi wind power operation and maintenance market which is evaluated as 450 million yuan per year. Furthermore, these projects will accelerate increase in trade, logistics and manufacturing business in Yanchi, which government will continuously facilitate Hanas projects and all together achieve “enterprise—government—poverty alleviation” beneficial consensus.